Troupe 5890 is Skyline's Theatrical Honor Society recognizing excellence in the theatrical arts. 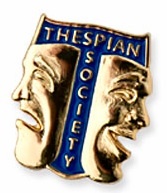 The International Thespian Society (ITS) is the Educational Theatre Association’s student honorary organization. ITS recognizes the achievements of high school theatre students. Since 1929, EdTA has inducted more than 2 million Thespians into ITS. Having a Thespian troupe at your school raises the profile and stature of your theatre program, making both your school and community aware of the activities and success of your students. A school has a Thespian troupe that is led by a troupe director—Mrs. Fry. Students earn an invitation to be inducted into the Thespian Society by participating in extracurricular theatre and accruing a minimum of 10 points. Accrue a minimum of 10 points for Skyline Theatrical productions and participation from 2013 to present. A record sheet and breakdown is below. Be a member in good standing of the SHS Drama Club. ​Any instances of dishonesty on the record sheet will prevent applicant from further consideration. Potential inductee applications will be collected each February. Inductions happen on an annual basis each May. ​As an Honor Society you can “letter” in Drama.